Hiya guys! Now I know what you're thinking already... Here comes Rose shoving Valentine's Day down my eye sockets. Well you are so wrong about that today! Kinda. Today I'm actually sharing my first Anti-Valentine polishes courtesy of the Trouble with Valentine’s Collaboration Box from Serum No 5, Cirque Colors & Lacquer Lust. Ah, yes these ladies are back together once again to create some magic! 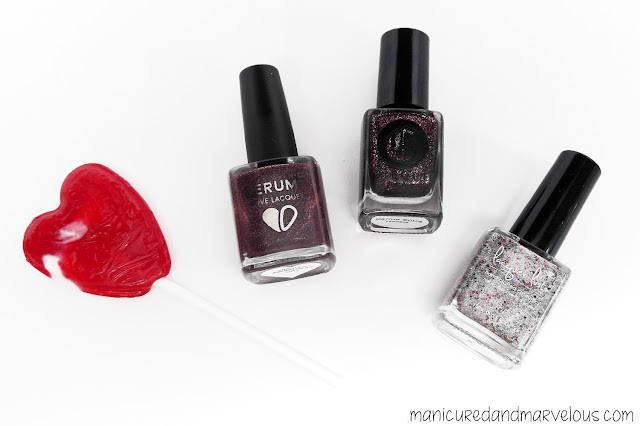 The Trouble with Valentine’s Collaboration Box is releasing today Friday, January 22nd for purchase through each makers shop: Serum No 5, Cirque Colors & Lacquer Lust and retails for $32.00. Update: Within the hour it has already sold out on Cirque Colors. Don't worry you guys still have a chance because at 3PM EST they will become available for purchase on both Serum No. 5 and Lacquer Lust website! 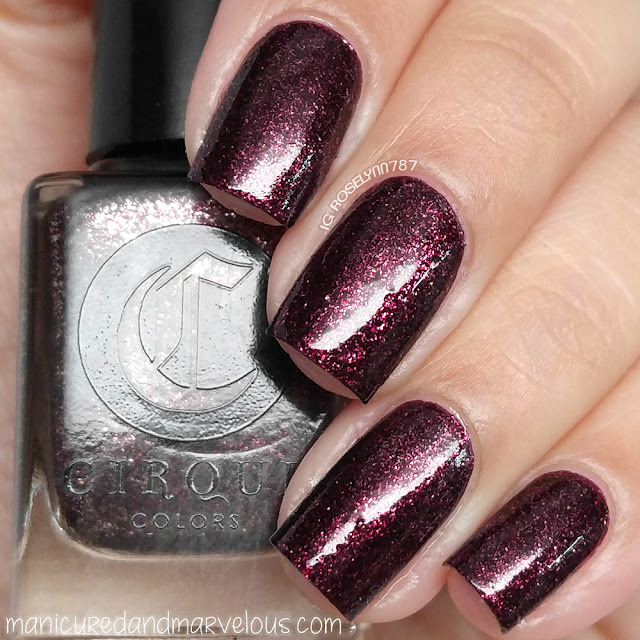 Karma Sutra by Cirque Colors can be described as a sparkling burgundy made with pure silver-coated micro-flakes. So vampy, so smexy. The formula is practically a one coater, it's so incredibly opaque and smooth. Shown here is two coats sealed with a glossy topcoat. Unloved Unicorn by Lacquer Lust can be described as a silver holographic micro-glitter with a bold mix of larger red, purple and black glitters. This is a full-coverage glitter, but you can definitely use it as a topper to a base. Formula is a little on the sheer side, but builds up nicely with just one additional coat. It does end up drying a bit on the gritty side and will need double the topcoat if you want a smooth finish. Shown here is two coats sealed with a glossy topcoat. Single's Awareness Day by Serum No. 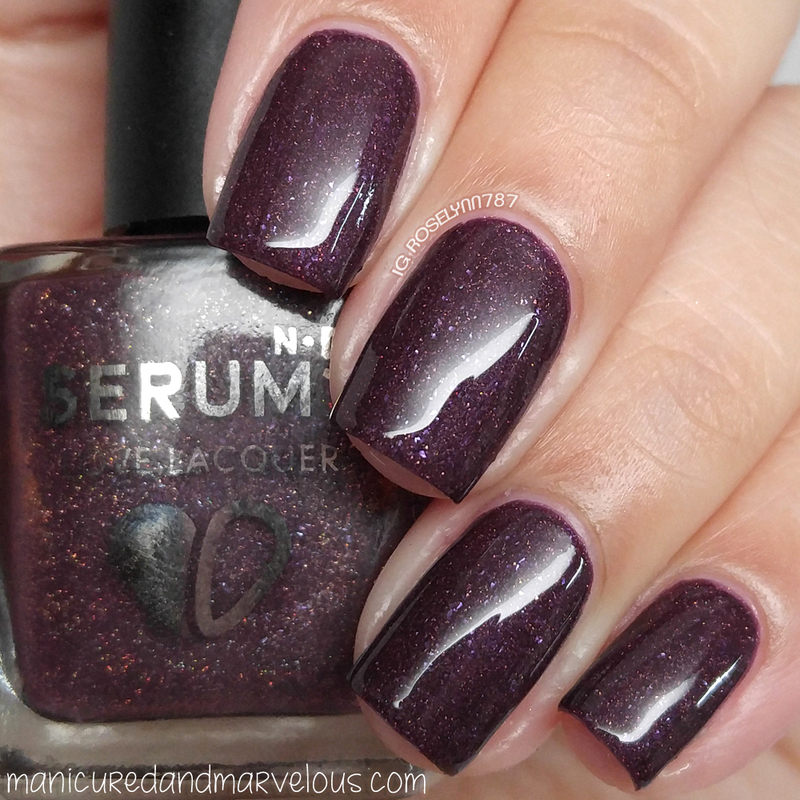 5 can be described as a rich, warm plum with copper holographic sparks that glows in the dark. 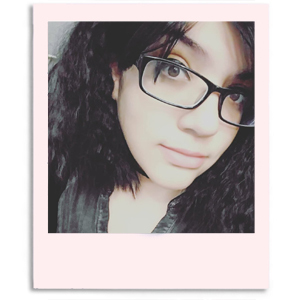 Unfortunately I don't have glow shots because I'm a derp who is still figuring out her new camera. Trust me though (and you can check out other blogger swatches as well) it does have a beautiful blue glow when it's charged. The formula has a thick consistency, but it is super manageable and easy to apply. It's also very opaque in a single coat, but will need the second to even out. Shown here is two coats sealed with a glossy topcoat. Overall, just like their last collaboration box, this one is an absolute must-have! It's the perfect gift to get yourself for Valentine's Day. My favorite part about these shades are how wonderfully opaque they are. It's perfect for a quick to-go mani or for some nail art too. I don't think I am alone in thinking these ladies should stick to having a permanent collab partnership from now on! Within the hour it has already sold out on Cirque Colors. Don't worry you guys still have a chance because at 3PM EST they will become available for purchase on both Serum No. 5 and Lacquer Lust website! Karma Sutra looks fabulous on you! Thank you! It was definitely my favorite. Right?! Her full-coverage glitters are always to die for. Your swatches of these are so droolworthy. Vampy shades are made for you! Love this box! So beautiful! Agreed! I adored your swatches for these. Gah, your swatches of these are beautiful! !